Now, that's a lot of change. A Virginia man used 300,000 pennies to pay sales tax on two cars at the Department of Motor Vehicles. 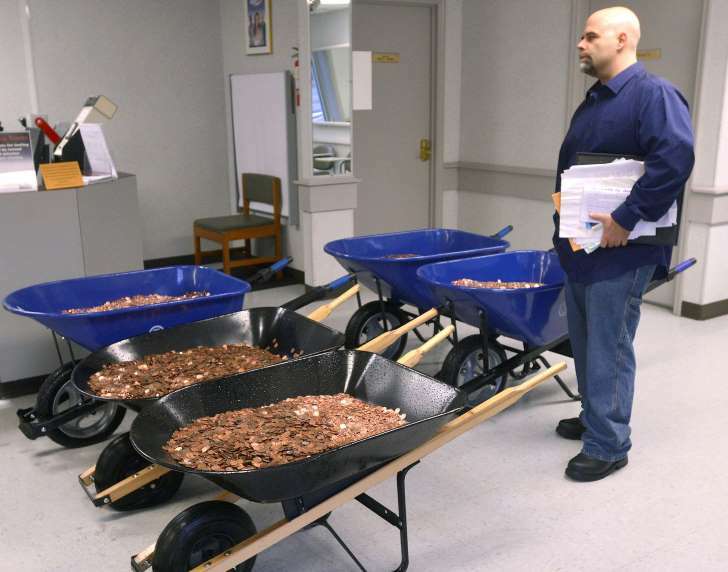 The Bristol Herald Courier reports (http://bit.ly/2jlMLsp) that Nick Stafford delivered five wheelbarrows full of change, mostly pennies, at the DMW office in Lebanon, Virginia, on Wednesday. The coins weighed in at 1,600 pounds. Stafford said he paid in coins to "inconvenience" the DMV. Stafford was upset because he was unable to find out the direct number to the Lebanon DMV until filing a Freedom of Information Act request. He later sued the state because he says he was denied direct phone numbers to other DMV offices in his area. Stafford ended up filing three lawsuits, which were dismissed Tuesday. The DMV has driven one man to do something extraordinary. On Dec. 11, Nick Stafford pushed five wheel barrels full of loose coins into Department of Motor Vehicles in Lebanon, Virginia, according to a statement he made on his company’s website. Stafford, who has been fighting with DMV for months, decided to pay $2,987.14 in taxes on his car with 298,745 pennies. The facility’s automated coin-counting machine couldn’t handle the load, and employees were forced to count the 1,548 pounds of change by hand. Stafford said that he arrived at the DMV at 9 a.m. Wednesday and staff was not done counting the pennies until early Thursday morning, the BBC reports. The whole thing stemmed from a longstanding grudge against the department. In September, Stafford tried to call his local DMV to ask what he calls a “30 second question” about where to register his car and pay the sales tax, since he owns multiple houses in the area. The phone number listed online put him on hold for over an hour. A direct line to the Lebanon DMV wasn’t listed online, so he made a Freedom of Information Act request for the number, which he was given. When Stafford called, the person who answered told him he wasn’t allowed to call that number and hung up on him. He called the same number repeatedly until he finally had his question answered. Yet, to “prove a point” he called the number again and requested the private, unlisted numbers of nine other DMV offices in Virginia. The Lebanon DMV refused, so Stafford took them to court. “If they were going to inconvenience me then I was going to inconvenience them,” he told the Bristol Herald Courier. Stafford dropped $165 to file three lawsuits in Russell County General District Court. One lawsuit was against the Lebanon DMV itself, and two were against specific employees. On Dec. 10, a judge dismissed all the lawsuits when Stafford was provided all the phone numbers in court by a representative from the state’s attorney general. Stafford has posted all of these numbers on his website. “I think the backbone to our republic and our democracy is open government and transparency in government and it shocks me that a lot of people don’t know the power of FOIA,” Stafford told the Herald Courier. Less than 24 hours later, he collected hundreds of rolls of pennies to pay his taxes at the DMV. He then hired 11 people at $10 an hour to help him break open the rolled coins. It took them four hours to do this, costing Stafford $440. He then bought the five wheelbarrows, which cost him another $400. All in all, Stafford spent $1,005 to get 10 phone numbers and drop off a bunch of pennies at the DMV. Not to mention the $2,987.14 he had to pay in taxes, which he happily brought to the DMV on Wednesday morning. According to Stafford, the employees at the DMV did not cause a fuss. “The DMV employees are being very respectful and accommodating considering the situation,” he wrote on his website. A man took revenge on his local Department of Motor Vehicles by paying a hefty bill using five wheelbarrows filled with 300,000 pennies. Nick Stafford used the change to pay an auto sales tax bill for $2,987.45. Employees at the DMV office in Lebanon, Virginia were forced to count each penny by hand to confirm they totaled the right amount, which they did. He said the pennies were payback for a dispute he'd been having with the DMV. But it came at a price. Stafford, who runs a vinyl decal business, had to pay his employees $10 an hour to count the coins. It took them four hours to count it all. “When we got the pennies from the bank they came rolled, so, instead of taking the pennies in rolls to the DMV, we paid 11 people to come with hammers to break up the penny rolls,” he said. He also had to purchase the wheelbarrows needed to carry the 1,600 pounds of pennies. But he said the extra expenses were worth it. 0 Response to "Virginia man delivers 300,000 pennies to DMV"